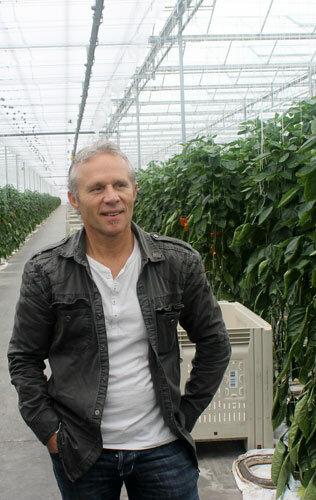 James Redekop is pictured in one of SunSelect’s environmentally friendly greenhouses in Delta, B.C. SunSelect Produce Inc., a family-owned vegetable producer with Mennonite roots, owns more than 28 hectares of greenhouses in Aldergrove and Delta, which they use to grow more than 9.5 million kilograms of vegetables each year. The company’s greenhouses that grow red, yellow and orange bell peppers in its Delta operation recently began using a new environmental technology called Green Carbon Capture, the first of its kind designed specifically for greenhouses. 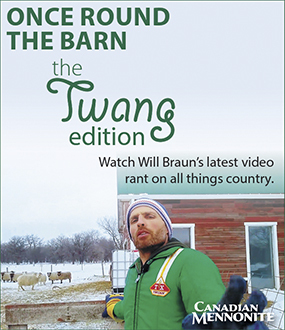 James Redekop—of the Redekop clan that invested in the Redekop School of Business at Canadian Mennonite University, Winnipeg—is a partial owner of SunSelect and he helped make the Green Carbon Capture project feasible. For Redekop, whose family came to Canada and made their living farming, investing in SunSelect was an act of conscience as well as a shrewd business move. Green Carbon Capture was invented by ProSelect Gas Treating Inc., a group of engineers and scientists from the Netherlands, which SunSelect has an investment in. The new technology makes SunSelect’s Delta greenhouses carbon-positive, providing it with thousands of dollars in carbon credits that it can sell or trade. The process also helps offset heating costs for the greenhouses. Because the plants need a great deal of carbon dioxide in order to grow in greenhouses, the Green Carbon Capture system converts wood waste from a nearby sawmill into fertilizer for the bell peppers, so that SunSelect doesn’t need to buy CO2 in liquid form. Only steam escapes into the atmosphere and all of the CO2 that the trees from the sawmill accumulated over their lifetime is now used. “We’ve found something that can increase our credit with the carbon footprint, and we can create CO2, rather than buying it,” says Edith Gubiotti, a daughter of the Krahns who established SunSelect. “[The work we do at SunSelect] is innovative, good for the business, and good for the world in general,” she says, noting that there are other companies looking at adopting the technology and adapting it to their specifications. The federal and provincial governments together provided about $3.25 million towards the $5-million project. Not only is SunSelect implementing new cutting-edge green technology, it is also involved in a program to employ Guatemalan citizens to work in the greenhouses. The company offers housing nearby and will soon have a large dormitory-style building on the Delta property so that migrant workers can live in close proximity to their work for a minimal charge.